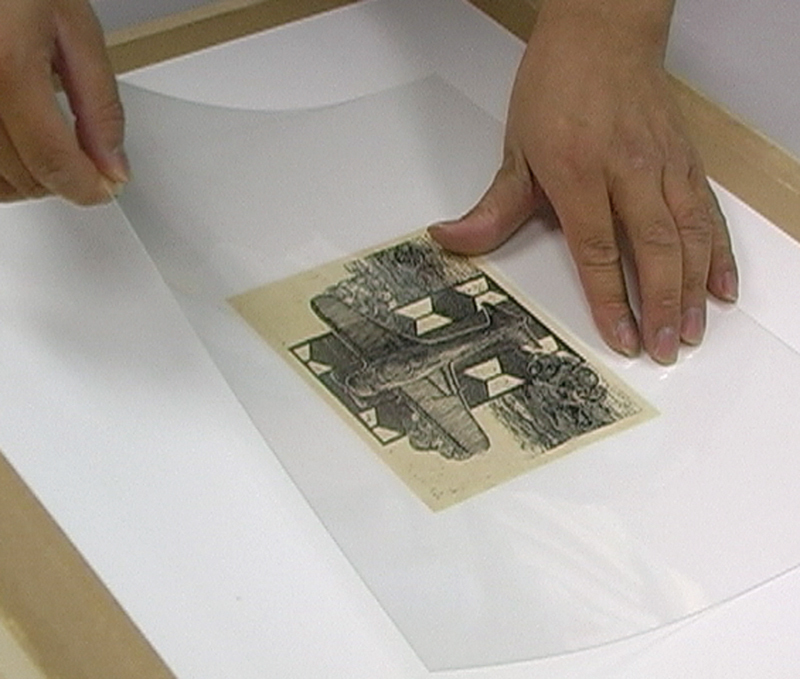 Backing is a technique used in lithography and wood engraving in which works printed on ganpishi and other thin paper are mounted on a thicker, sturdier backing paper. Although this method is often used in wood engraving where the work is hand-printed on a thin piece of ganpishi paper etc., it is also employed widely in various types of prints where thin paper is used, as well as for drawings. The backing paper used is usually Western paper with adequate thickness and durability. BFK Rives is particularly preferred as it is durable and suitably flat and smooth. In wood engraving, when work is printed on a thin piece of paper such as ganpishi, the ink will seep through to the rear side of the paper. The color of the ink is as clear on the back as on the front. This characteristic is sometimes utilized in a method known as kagamibari (mirror image pasting) in which two prints, one showing the front side and the other showing the back, are mounted on the backing paper side by side or on the top and bottom in symmetry. This produces a symmetrical work as if the image is being projected on a mirror. 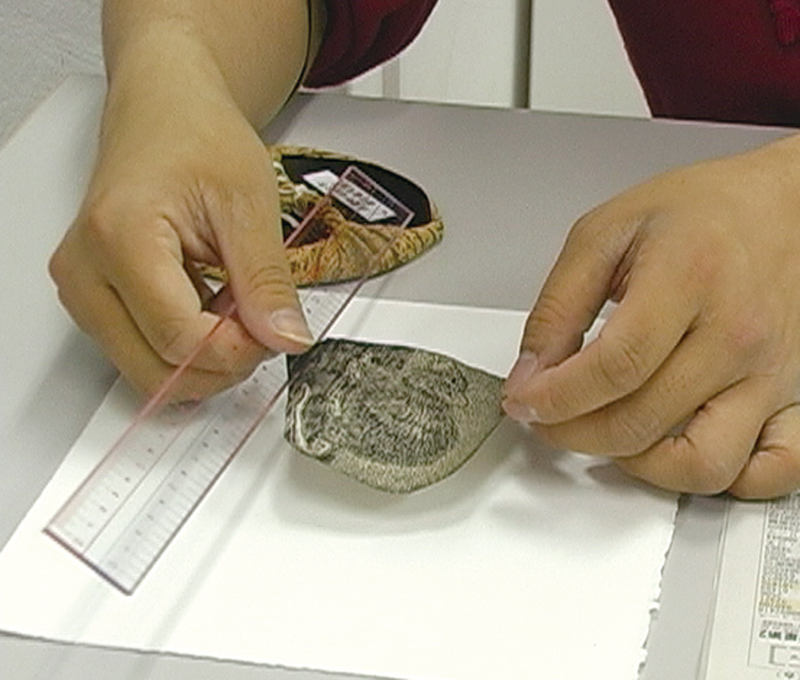 To mount work on a backing, first of all, take a dried printed work and cut it to the desired size. Then, moisten the backing paper and spread it flat on a board made of plywood etc. Place the work which you just cut out on a thin transparent polyvinyl chloride (PVC) board (a thin acrylic board will also do) with the back side of the work facing up. Use a brush to coat the back of the work with starch glue diluted with water, working in circles from the center. After applying glue on the entire back surface, wipe off any surplus glue on the PVC board clean with a piece of cloth. Lift the PVC board holding the work coated in glue, press this on top of the backing paper and remove the PVC board only. To affix the work firmly onto the backing paper, pat it with a brush outwardly from the center to let out the air trapped underneath. 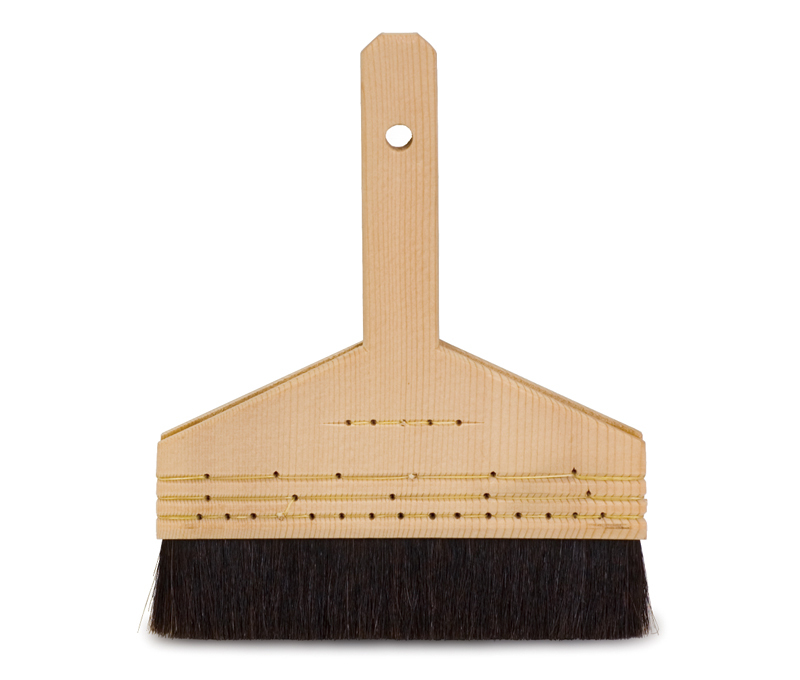 If a brush is not available, place the work over some backing paper and use a roller to apply pressure on the PVC board. Besides using starch glue, a glue stick can also be used to stick the work onto the backing paper. Backing is a traditional technique which has long been used in a variety of fields to mount not just prints but also calligraphic works and paintings. In Japanese paintings this technique is used to reinforce washi and eginu (silk canvas) by mounting them on Hosokawa paper and thin Mino paper using shofunori (wheat starch paste). There are two types of backing techniques in Japanese paintings: hon-uchi and jigoku-uchi.